At the Council meeting on Wednesday, 25th June, H&F’s Conservative Administration again voted against plans to give the five wards with the highest crime rates 24/7 police task squad protection - making that the third time in two years. Hammersmith Broadway and Askew wards would have been amongst those that benefited. Residents are rightly asking why the Conservatives did this, especially when Metropolitan Police figures show that, during the 12 months to end of March 2008, the overall number of crimes in Shepherds Bush rose by a staggering 4.6%. Latest figures also show that Hammersmith and Fulham Council now languishes behind a host of other London councils in the battle against crime. Prior to the 2006 elections the last Labour Administration had managed to achieve a 10% drop in crime across the whole borough – which made H&F the leading council at fighting crime in London at that time. Now we’re lagging behind Lambeth, Islington, Richmond and others. H&F Conservatives have actually cut Council funding to the ward with the highest crime rates and were humiliated after local residents campaigned against that policy. So why not provide extra police, which is what the Tories had promised before the election? At the Full Council Meeting on Wednesday, 25th June local people got their answer. It wasn’t what was expected. H&F’s Council Leader, Cllr. Stephen Greenhalgh (Con) explained that it was all to do with the latest opinion poll results. H&F Council had canvassed residents’ opinions on a range of matters and the results are just in. They have apparently found that 56% of residents ticked a box with the words “to some extent” when asked to agree with the statement “My Council is working to make the area safer”. Using the poll results as his response to our request for more police; Cllr. Greenhalgh told us that he was delighted with them. His explanation seemed to be; the public are relatively happy, the Conservatives are riding high in the polls so no need to provide extra investment in local police. This is a breach of H&F Conservative’s pre-election promise to make crime fighting the Council’s number one priority. We are now two years away from the next Council elections. If Labour is elected to form H&F Council’s Administration in 2010 then we guarantee that we will increase investment in crime fighting and do MORE than the current Conservative Administration. At the very least (and as a start), Labour will provide 24/7 police task squad protection for the five wards with the highest crime. Was it not Cllr. 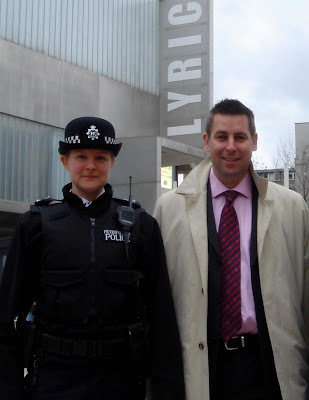 Mark Loveday who said the Council's police scheme was "a bit of a gamble"?! As he's the person on our Conservative run council who is responsible for crime strategy, I would have thought they would have had a better plan than "gambling". Now it seems that the "gamble" hasn't paid out and we are all losers.